Do You Have Questions About Children’s Dentistry? A healthy smile can actually improve a child’s overall wellbeing. To help little smiles stay healthy children need regular dental care. Do you have questions about children’s dentistry? Would you like to know more about preventive treatments that protect smiles from tooth decay? Question: What does a kid’s exam involve? Answer: During the exam the doctor will explain each step with the patient and address any questions the young patient may have. The doctor will examine the teeth for any signs of developing issues, including tooth decay and gingivitis. If any treatment is required, the dentist can discuss options with the parents following the checkup. Question: Does my child need a cleaning? Answer: In many cases we will recommend a cleaning for a child. The procedure involves removing the plaque from the surface of the teeth. Plaque can inflame the causes, leading to gingivitis, and erode enamel, causing to cavities. Brushing and flossing alone cannot remove the buildup. Afterward, the teeth will be polished. Question: Does the doctor offer preventive services? Answer: Yes. To help strengthen the child’s natural defenses against tooth decay fluoride can be applied in the form of a varnish. The procedure takes minutes and can help kids avoid tooth decay. In addition, we can coat the back teeth, which are often hard for kids to reach when brushing, with a layer of plastic sealant. Question: Should my kid brush and floss? Answer: Absolutely. 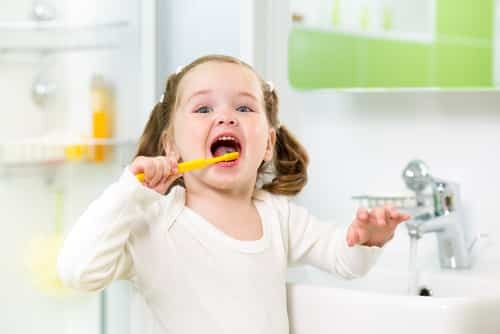 As soon as there are teeth there to brush you need to help your child brush twice a day for two minutes per session. Likewise, once multiple teeth erupt the child should begin flossing with a pick before upgrading to traditional floss as motor skills improve.